Open court play is Monday, Wednesday, Friday 5:00 am- 7:30 am and Saturday 6:00 am- 6:00 pm in the Multi-Purpose gym. Six courts available; we also have paddles and balls for those who need them. Classes include 30-45 min. of instruction followed by 45-60 min. of coached practice play. Paddles and balls available for those who don’t have their own. Semi-Private lessons are for teams of partners who want to practice together. Group lessons are for groups of four or more who like to play together and want to learn in a smaller more focused setting. 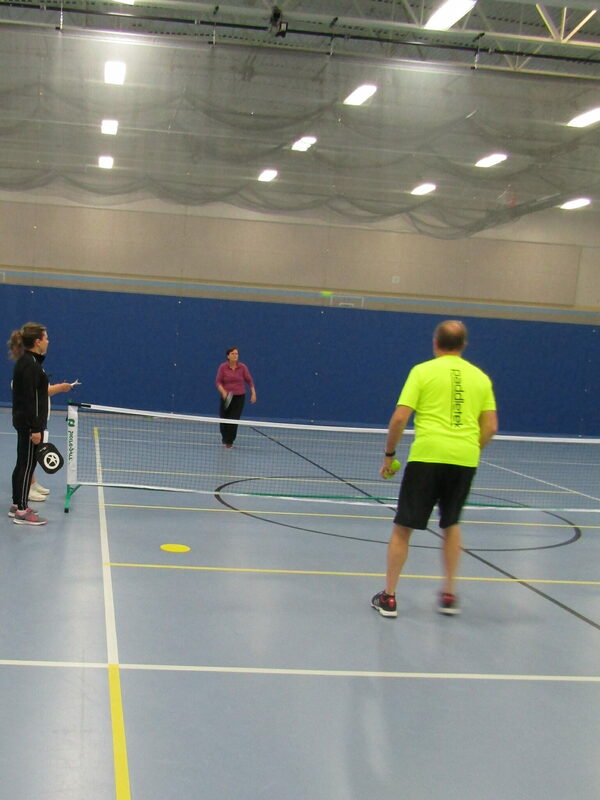 Contact our Pickleball Pro, Vic Phillips, at vh_phillips@comcast.net to schedule a lesson. Sign up as an individual for Men’s, Women’s, and Mixed events. Play with everyone in your pool. Top two players from each pool advance to medal round. Sign up as a doubles team for the Skills Challenge event. Skill challenges include serve/return to target area, 3rd shot drop, Dink rally, bing-bang volley. Top three finishers get Gold, Silver, Bronze; bottom four play consolation round mixer. All matches are one game to 15, win by 1. Switch sides after one team reaches 8 points. Tie-break order determined as follows: Most wins, point differential, first to check in. Snacks and t-shirts will be provided. If player does not have a USAPA rating, please refer to IFP self-rating guide to determine rating at http://ifpickleball.org/ifp-rating-descriptions/. Serves and returns within three feet of the baseline score. Points for number of consecutive dinks with your partner in one minute. First partner feeds the ball from kitchen line to partner at opposite baseline; partner tries to drop the ball into the kitchen. Points for number of consecutive volleys with your partner in one minute. Online registration is quick and easy. Follow the link below and follow the instructions on the website. Find updated scores, schedules and standings online! Looking for a Recreation Center membership? You can see our pricing and find additional information by visiting our membership page! Or, give us a call and we’ll answer any questions you may have.